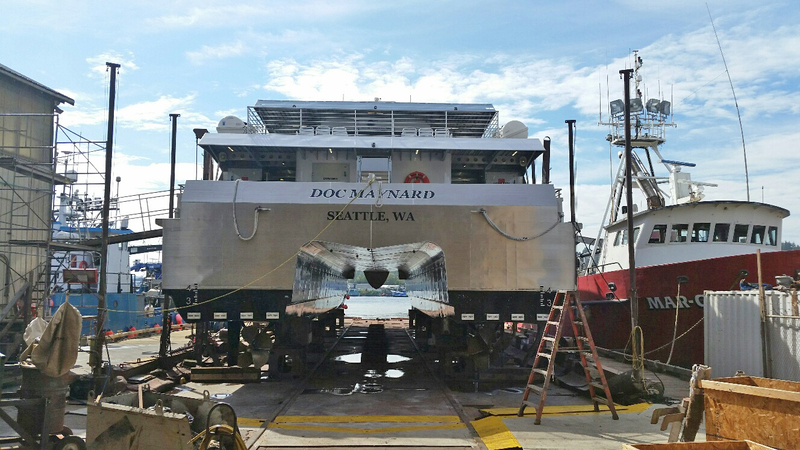 Hard to believe, but it’s already been a year since the MV Doc Maynard first launched. When a milestone like that comes up, it’s time for an important checkup. Last week passengers again rode the MV Spirit of Kingston to and from West Seattle, while the Doc Maynard was temporarily out of service in drydock Sept. 14, 15 and 16. As part of the vessel build contract, at the end of the one-year warranty period the vessel was to be drydocked, inspected and any deficiencies corrected by the manufacturer. 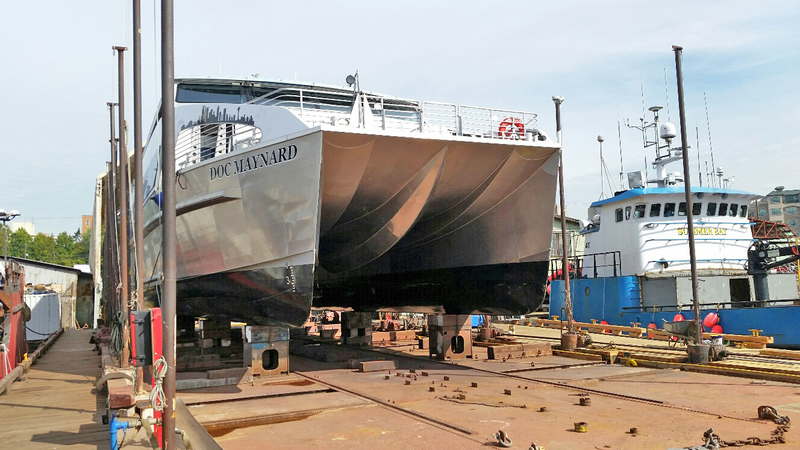 This inspection included a complete walk through of the vessel inside and out to ensure all coatings – like the hull paint, vinyl and non-skid coatings – were in good condition. Inspectors checked to make sure all seating, flooring and finishes were in good condition and had only normal wear and tear – and no premature failure. The vessel passed its warranty inspection after fixing just a handful of items. While the vessel was out of the water, minor repair work was done on the hull and it got a thorough washing. Stem to stern, everything that’s needed to keep the vessel running reliably completely checked out. The Doc Maynard’s 278 passenger capacity was invaluable through our record ridership this summer. The Spirit of Kingston (capacity 147 passengers) would have been challenged to keep up with these growing numbers. In addition to her capacity, the Doc Maynard offers 26 bike racks, bow passenger access for additional outdoor viewing, many ADA amenities, and a smooth, scenic ride. All of this amounts to the perfect vessel for this very popular route! ← Ridership is up, marking another great summer on the Water Taxi!